Well… It’s done. 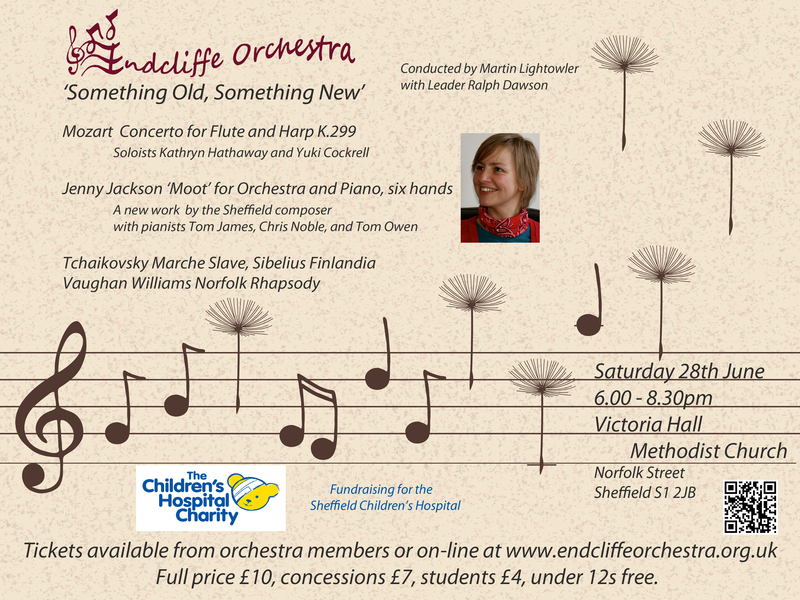 Moot for orchestra and piano, six hands, is complete, and the score and parts are with Sheffield’s Endcliffe Orchestra, in preparation for the premiere on June 28th at the Victoria Hall, Sheffield. I did intend to blog about the piece’s progress as it developed but I clearly did not manage to divide my creative output between the two activities, and the composing had to come first. So; what can I tell you about the process in retrospect? Generating the musical material I spent quite a lot of time at the start of the creative process drawing in pencil on large rolls of paper. I find that this method of sketching enables me to capture the essence of my compositional ideas before questions of pitch, meter and rhythm, dynamics and timbral nuances, or notational language have to be considered, and allows me to work gesturally and instinctively. In this way, a shorthand version of an idea can be captured, quickly, in a tangible form and the level of detail can be decided at a later stage. During this process I began to identify gestures and motifs, often with specific instruments in mind, and then I developed these choosing to follow the shapes strictly or flexibly, depending on the context. This way of working enables me to visualise the interaction of multiple parts in relative pitch terms (so the top of the page is the highest pitch and the bottom, the lowest) as well as the shape of the entire piece, or the proportions of sections within the overall structure, which is harder to achieve in a musical score. In this way I can see where, for instance, passages of intensity or climax occur and how to juxtapose these with other, contrasting passages to greatest effect. Instrumentation and balance I know it was my decision but, if writing for orchestra wasn’t a big enough balancing act, the addition of piano, six hands, was almost enough to stop me writing the piece at all. I had imagined a mad piano concerto, with a crazy six-handed soloist providing numerous opportunities for the theatrical and comical but, in reality, it presented itself as a major challenge which was far from amusing. In my piece Desire Lines (2011), for piano, six hands (a set of four miniatures which have provided some of the material for Moot), the close proximity of the three players gives rise to a theatricality of performance, the concept of which informed the compositional process. In Moot, I chose not to capitalise on this aspect, as it will probably happen incidentally. Instead, the piano is treated as just another (often percussive) instrument in the orchestra’s forces but with the spotlight on it from time to time. The number of hands allows for a density, complexity of texture and greater coverage of the keyboard than when played by a single pianist, and this needed careful handling so as not to overload the sound when playing with the orchestra. It is easy to fall into the trap of feeling like you have to make use of all players all the time or, at least, enough so that they feel involved, utilised and avoid getting lost(!). I made a conscious effort to pare back and be selective, although there are moments of controlled cacophony. I have included passages of sparse orchestration and juxtaposed them with more robust, chaotic material, which employs the entire orchestra (including three percussionists and the timpani player). I have tried to keep in mind lessons learnt from working with the Nieuw Ensemble, Amsterdam, in 2009 when I composed Self Portrait. This piece is scored for twelve instrumentalists, including winds, strings, percussion, piano and harp, as well as mandolin and guitar. The lack of attack or sustain in the plucked instruments means that they can not possibly fight to be heard so they must be exposed, instead, in light and roomy scoring, so that the individual instruments’ unique colours can be heard. I can’t say for certain that I’ve achieved this in Moot as I haven’t had the opportunity to hear the piece yet, but I was definitely conscious of the potential for creating a big, grey sludge with no definition or clarity. Notation As the piece was commissioned by, and will be premiered by, a development orchestra for players of ABRSM Grade 5 and above, I was careful to write within a comfortable range for players, and I have used flexible notation wherever the character can be achieved through more generalised pitching, rhythm or timbre. Some parts are harder where individual strengths have been identified in the orchestra – the leader is semi-professional so I have included a violin solo, for instance. Although scoring and type-setting may appear to be the final stages of creating a new work I find that until I know how to present it on the score I can’t find the vehicle to develop my musical ideas, so there is a lot of trial and error involved, and many different ‘versions’ created. One such notational problem was working out how to score for three timpani with one drum that plays almost entirely – but not exclusively – pedal glissando, and therefore has no fixed pitch throughout. Once I separated the three drums onto two staves, with the pitched drums notated on a five-line stave and the unpitched drum on a one-line stave, the part was easy to compose. In the same way, the low brass and strings read from one-line staves during the opening passage because I calculated that the resulting effect will be more-or-less predictable regardless of specific pitching. There is a written instruction to perform ‘very low’, and the one-line stave indicates the approximate and slight variation in pitches above and below the chosen starting pitch. This should also mean that players choose pitches within their own comfortable range so they will be confident to perform them. Overall, the changes in the notational language throughout the score support the movement between passages which appear ‘in focus’ (where rhythm, meter, pitch and co-ordination are controlled), or ‘out of focus’ (where durations and pitch are flexible and the conductor merely controls the vertical co-ordination of evolving blocks of texture – and, therefore, the pacing of the piece at these points), and varying degrees in between (where some instruments are co-ordinated and some play independently, for instance). Categories: Contemporary music, Uncategorized | Tags: Chris Noble, Contemporary music, Endcliffe Orchestra, Jenny Jackson, Orchestra and piano six hands, orchestral music, Platform 4 - composers, Tom James, Tom Owen | Permalink.